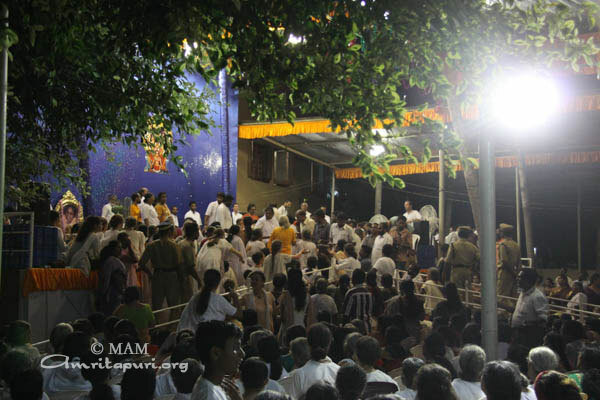 When Amma arrived at her Brahmasthanam and Ashram in Kaimanam, Thiruvananthapuram on the evening of the 22nd April, lamps had been lit all along the roadside leading to the ashram, creating a welcoming and beautiful path for Amma. 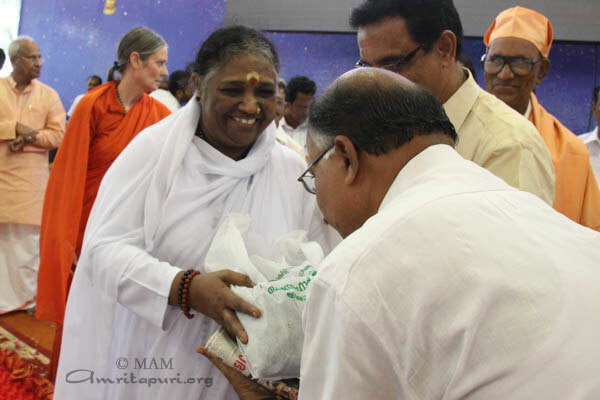 Upon arrival, Amma served Prasad to the devotees and conversed with them. 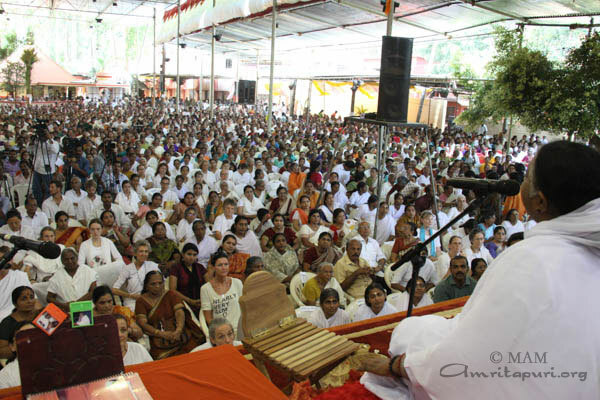 The following day, on the first morning of Amma’s programmes, Amma was presented with the first-ever Vishwaretna Award by the Maharaja of Travancore, on behalf of the Hindu Parliament. Presenting the award, to overwhelming applause the head of Travancore’s royal family indicated that this was one of the most fulfilling moments of his life. After the award ceremony, Kerala’s Minister for Agriculture K.P. 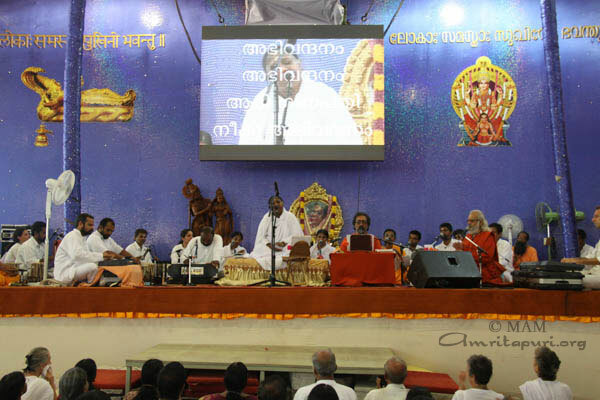 Mohanan presented organic seeds and fertilizers to 500 people as part of M.A. 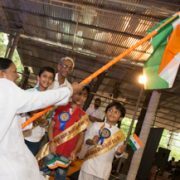 Math’s new Haritamritam program, aimed at encouraging households around the state of Kerala to take up organic gardening and organic farming, thereby promoting health and vitality as well as a renewed appreciation and reverence for nature. 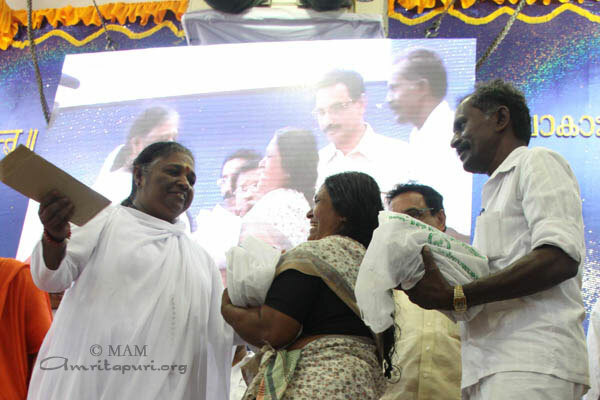 During the program, Assembly Speaker G. Karthikeyan said that Amma was a refuge to the world suffering from all ills. 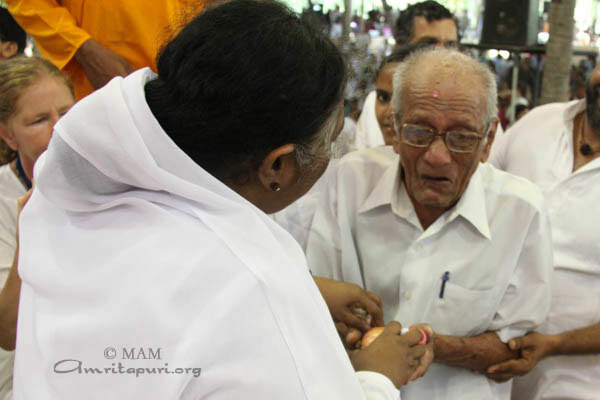 The devotees were largely sheltered from the blazing summer sun as Amma took care to make sure that shelters were erected throughout the ashram, creating nearly unbroken shade for all her children. 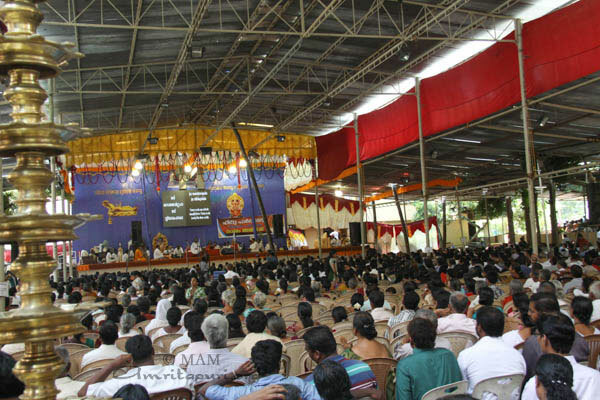 Addressing the devotees, Amma emphasized the need for protecting environment. 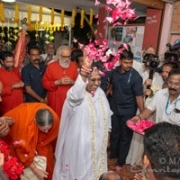 She exhorted the authorities to restart the ‘Sevanavaaram,’ a week-long cleaning programme taken up by schoolchildren. “Nature, which once blessed us with resources, is now in a state of devastation. We have destroyed our nature by 40 per cent within a span of 25 years,” she said. 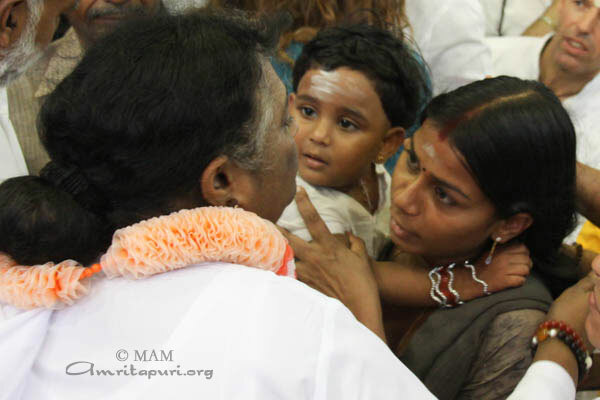 On the last day, Amma sang bhajan ‘Elappula Elo’ with her children. 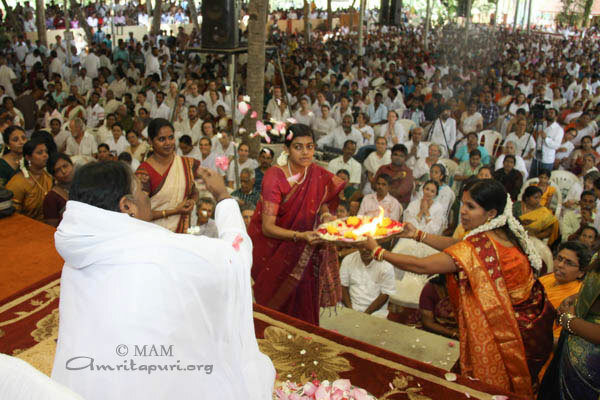 The ladies dressed in silk sari danced beautifully to the tune of Amma. “It was like so many Devis’ (goddesses) dancing. You all danced naturally in union. 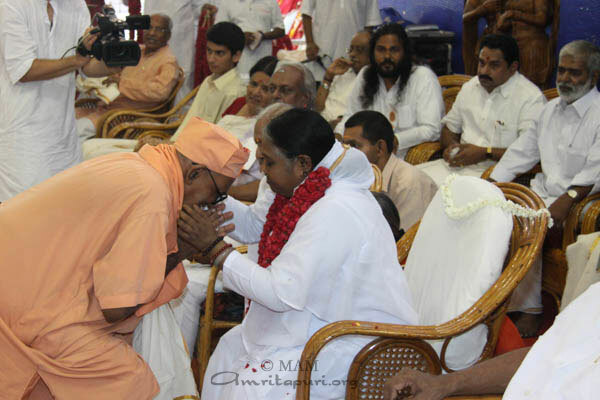 It was very good” said Amma on the mike about the dance. 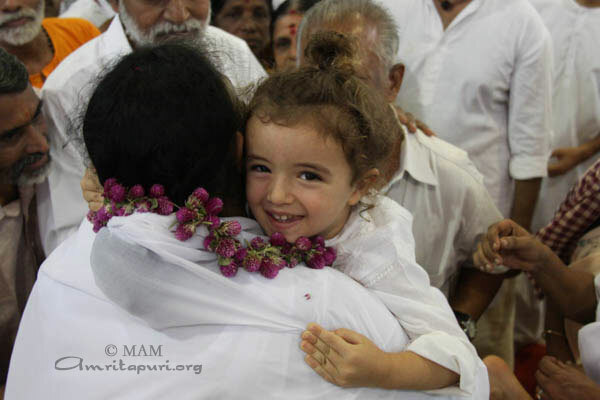 The darshan came to a close after 3:00 in the morning, bringing Amma’s 2013 South Indian Yatra to a joyful, sweet denouement.